WSDOT and SDOT plan to use signal technology to prevent traffic on the SR 99 tunnel’s Mercer Street off-ramp in South Lake Union. SEATTLE — The State Route 99 tunnel’s Mercer Street exit to South Lake Union from the northbound lanes comes with some challenges for both traffic engineers and drivers. The off-ramp is a sharp curve that leads onto Republican Street and then a stoplight on Dexter Avenue. 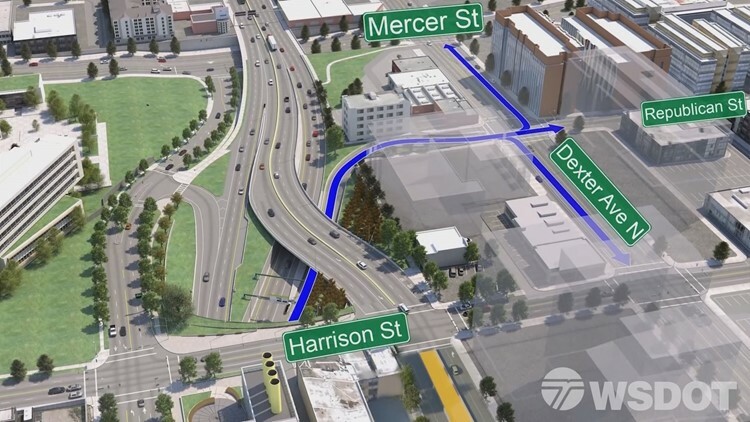 Drivers have the option of turning left to Mercer Street to connect to Interstate 5, staying straight on Republican Street into South Lake Union, or turning right on Dexter Avenue towards Denny Way and downtown. The off-ramp puts drivers into the heart of a neighborhood that can already turn into a parking lot during rush hour. The Washington State Department of Transportation admits tunnel planners couldn’t anticipate how bad the Mercer Mess would become. Dexter Avenue also lost a lane of traffic to bikes. Now traffic engineers worry vehicles trying to exit the tunnel will join the gridlock. “One of the things that WSDOT’s very concerned about is having this long back-up that comes off the ramp and backs up onto the highway,” said Sowers. If drivers exit SR 99 at the tunnel's north portal, they can turn left to Mercer Street and I-5, turn right to Dexter Avenue North, or continue straight to South Lake Union destinations. That’s why WSDOT is working with the Seattle Department of Transportation on what they call queue detection. It is technology that allows traffic lights to recognize when cars are backing up on the tunnel off-ramp and change the signal times. Bike traffic could also back up the off-ramp if engineers limit right turns onto Dexter Avenue. Sowers says the bicycle community is concerned about drivers exiting the tunnel and turning right on Dexter Avenue on a red light without checking for cyclists in the bike lane. It’s something SDOT will be monitoring and the city could limit those right turns if they put cyclist safety in jeopardy. “We have to be nimble and flexible and change signal times and access points just as much as we can to facilitate mobility and safety,” SDOT Director of Mobility Heather Marx said.